I promised you last week that I would give you the GRID to use in planning out a painting. This is used to decide where to have the focal point of the painting. It is very important because the focal point should never be in the middle under normal circumstances. There are exceptions to this rule, but I won't go into that now. Just suffice it to say that NORMALLY the focal point is located at one of four points on the canvas. The GRID shows where those four points are. 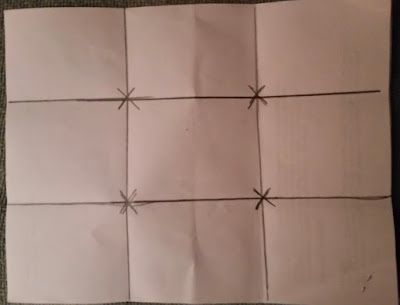 I drew out the grid on a regular piece of paper 8 x 11. So this would translate to a normal rectangular canvas, but also is used on a square canvas. Basically you divide the canvas vertically into three even spaces and draw lines down. Then do the same horizontally, again drawing lines on the divisions. You end up with nine boxes on the canvas. The lines meet in four places. I drew an X on each spot. The focal point should be placed on one of those four X's. I have a photo below to show what I mean. When you do this your painting has MUCH more interest than otherwise and everyone thinks you are an instant artist! But really, it is a VERY IMPORTANT principle to learn! So, once you have decided where your focal point is going to be, THEN you must decide how you will get the viewers eye TO that focal point! This is also very important! You can use a winding road, a winding stream of water, trees and bushes or even flying birds, flowers, rocks, etc. But they start big in the front and get smaller as they go into the distance and the eye naturally follows them to the focal point. PLEASE do not make the line straight however, as it takes the eye too quickly to the focal point and then gets bored! Trust me on this. You actually want the eye to move around the painting without LEAVING the painting. It sounds hard but it actually isn't. Just study paintings online or in galleries, museums, etc and pay attention to these details and you will begin to see a pattern. Trees lean into the painting, grasses lean toward the middle or the focal point, birds flying toward it, etc. It is subtle but it is there! 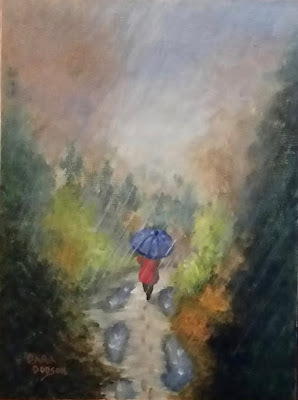 A road never leads off to the side or top of a painting. It curves into the painting, NEVER OUT. If a river leaves, it is cut off by trees, mountains, or something else to stop the eye from leaving. Trees, bushes, buildings, fence posts, animals, people, etc cut off the edges to keep the eye in the painting. It is always subtle, never really noticed as an eye stopper. it does the job by turning the eye back into the painting. It is so cool how it works! 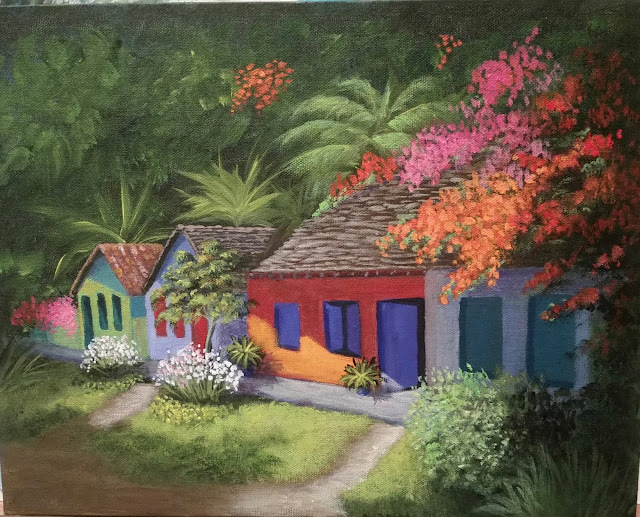 Look at my paintings below and see if you can pinpoint the focal point or it can be called center of interest. It us usually a little brighter, more in focus, or stands out in other ways. Some are more subtle, but the eye is always led to that place in the painting and hopefully rests there for a while. That is the goal! Next week I will explain the VALUE SYSTEM. 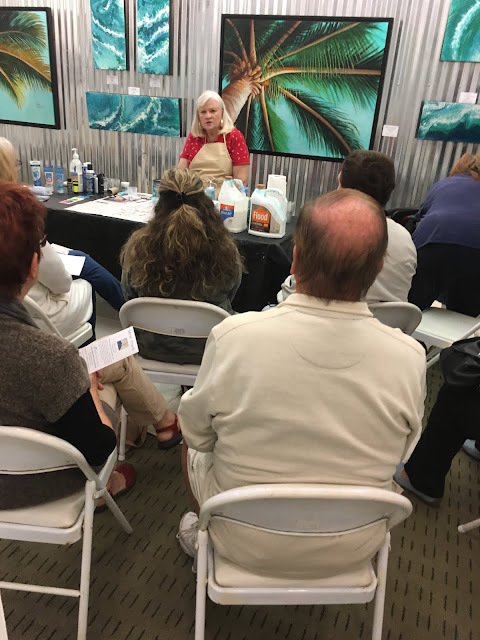 The backbone of good paintings! It is absolutely essential to understand the value system. Without this, the paintings will have no depth and hence look flat. 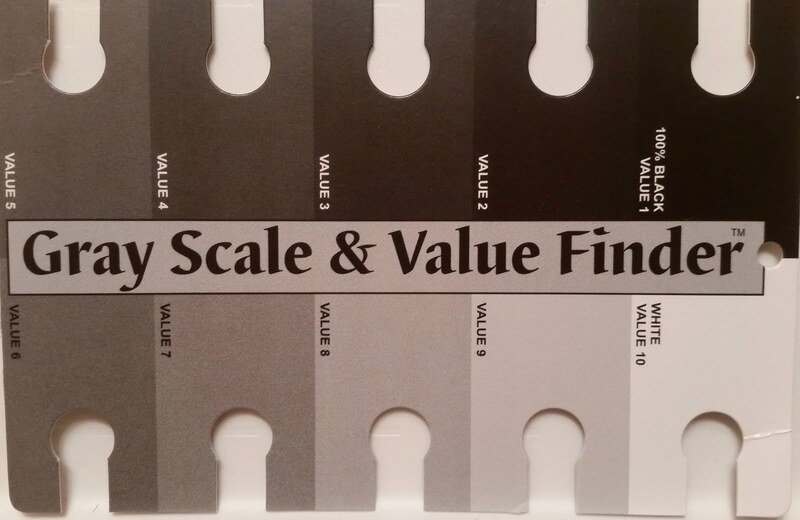 I have a picture of a VALUE FINDER below. Look at it and buy one if you don't already have one. Or you can make one, but they are very inexpensive so I prefer to just buy one. I ALWAYS have mine close by as I paint! They are invaluable! Now, for my two new paintings. 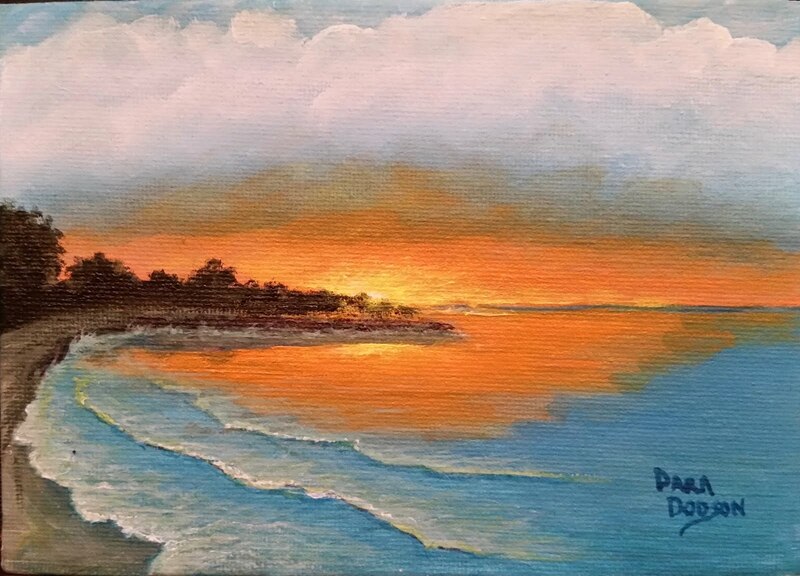 I did a small beach scene and a little larger Caribbean painting. I decided that I wanted to start a new series of paintings. I got the idea from a picture of some Caribbean houses I saw in a magazine. They are quite colorful and around here colorful is always popular! So that was an easy decision. I had a lot of fun and everyone loves it! Great! Onward and upward, as they say! Ok, that's an old saying most of you won't know. But it means "keep going" you are on the right track. Anyway, thanks for looking, enjoy, and see you next week. Practice doing some drawings using the focal point grid and see if you don't see a difference in your work! If you picked the orange house as the focal point, you are right! Notice how the eye wants to go there and stay? That is what the artist wants you to do! Even the slightly open door invites the eye to stay. Subtle and effective.